An expense is cost incurred from work-related tasks and/or purchases (travel, meals, office supplies, etc.). Expenses may be non-billable or billable, the latter applying to expenses for a project funded by a specific client. Users complete and submit their expense sheets to team lead, project manager, and/or clients for approval. The expense sheets are then reviewed and either approved or rejected. When the expense sheet is approved, the expense information is saved to the database. Once an expense sheet is submitted, the data can be analyzed by project leaders and administrator to determine project costs and client billing. A single expense sheet allows user to submit multiple expenses. A user fills out and submits an expense sheet, uploading any available receipts. The user can choose which project each expense was associated with. User can print an expense sheet for signature purpose. The expense sheet is automatically sent to one or more approvers. The approvers approve the expense sheet. The finance department can reimburse the user based on the approved expense sheets. The expenses can be exported for client billing or reviewed against project estimates. Expense sheets screen can be access using <My Area> — <My Expense Sheet> from main menu. Or from top menuEXPENSES]. A user can add a new expense sheet by clicking on[Add New Expense Sheet]button. A user can filter all expense sheets using approval status and date range. A user can edit any expense sheet by clicking on[Edit]link of that expense sheet. 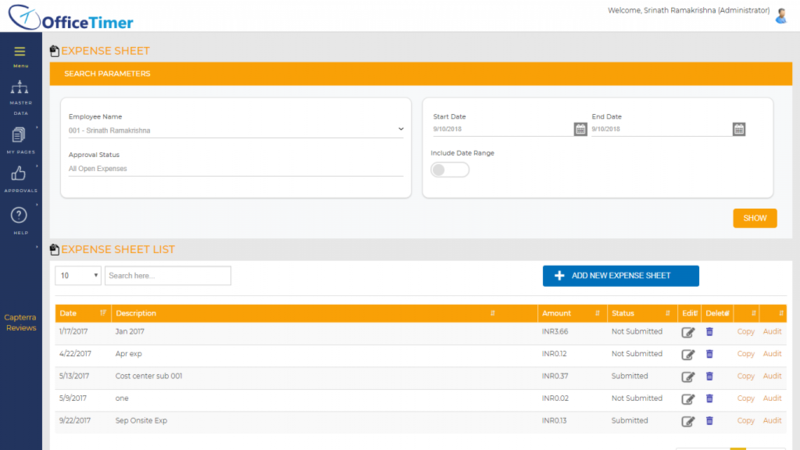 A user can duplicate any existing expense sheet by clicking on[Copy]link of that expense sheet. A user can delete an expense sheet by clicking on[Delete]icon of that expense sheet. Click on[Add New Expense Sheet]button in expense sheet list. Enter expense description on top. Click on […] to open date picker for expense entry date and select your expense sheet date. After adding expense sheet information, user should enter expense entries records using instructions mentioned below. 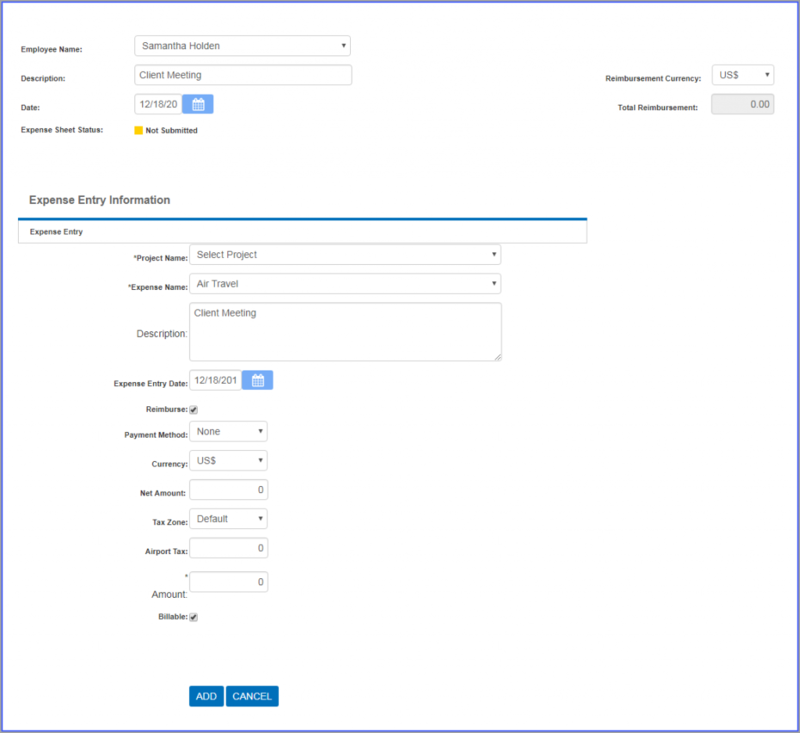 In[Expense Entry Information]form, enter project name whose expense entry you want to enter. Enter description of expense entry. Select[Reimburse]check box if you paid for the expense and require reimbursement. Select different available payment methods like Cash, Credit Card etc. Select currency of your expense. Select quantity field (if this expense is configured to get input of quantity field). Rate (if this expense is configured to get input of quantity field). Tax Amount (will be appear only if this expense is configured as a tax able expense). Enter amount of expense entry. Click on[Add]button to add this expense entry. Click on[Attachments]link on expense entry to open attachment page for that particular expense entry. You can then upload receipts and other expense related documents at this page. In[Expense Entry List], click on[Delete]link of record which you want to delete. In[Expense Entry List], click on[Edit]link of record which you want to modify. Update your required modification in[Expense Entry Information]form. Click on[Submit]button to submit expense entries for approvals.